Information & Rates of Taxi, Bus, Car Rental. Taking the bus in Bucerias is both easy and entertaining. It can sometimes be likened to an extreme sport. You don't need special gear, but please hang on, you're in for the ride of your life. Taking the bus within town is around $6 pesos. To get to Puerto Vallarta, the price is $12 pesos and it takes you to within walking distance of the Malecon. Simply look for a bus with CENTRO painted on it. Getting back is a little tricky. 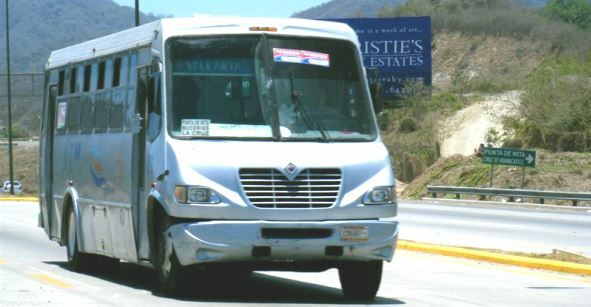 Take a bus to WallMart for $6 pesos, then take a bus to Bucerias for $12 pesos (there are no transfers). TIP: You might need to flag a bus down for them to stop and bring exact change if possible. You may have onboard entertainment. Sometimes an individual will get on to the bus and will sing, play guitar or just try to entertain, which of course is based on tips. If you enjoyed the show, feel free to tip a few pesos. 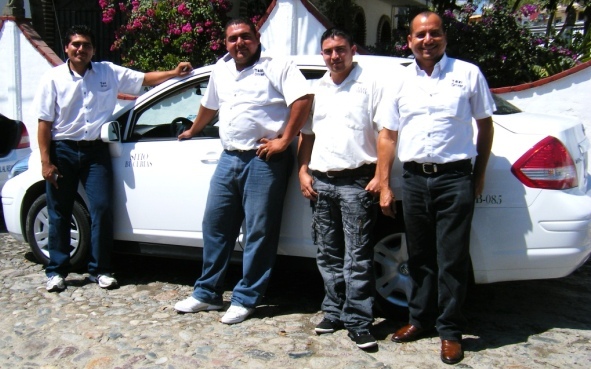 To take a Bucerias taxi to: Anywhere in Bucerias $50-$70 pesos, Wal-Mart Nuevo Vallarta $100 pesos, San Vicente $135 pesos, Nuevo Vallarta $100-$135 pesos, Airport $412 pesos, Puerto Vallarta Malecon $412+ pesos. Going the other way - La Cruz $85 pesos, Punta de Mita $200-$250 pesos, Sayulita $200-$250 pesos, San Pancho $250-$300 pesos. Make sure you confirm the cost of the trip with the driver FIRST before getting a ride. If the price is not within a reasonable range of the above prices you may decide to find another cab. If you are at the Puerto Vallarta PVR Airport, you can take the Airport taxi (Federally licensed). You will see the booth straight ahead once you leave the glass doors where arrivals come out. Tip: After getting your luggage and heading towards the taxi stand, avoid speaking with the aggressive vendors before crossing the sliding doors (even if they look official - they are Timeshare People (you may not be to keen on actually sharing your vacation time as much as their position indicates). There is an official taxi booth where you can buy tickets once you enter the airport. Again...before you reach the sliding doors, timeshare people may shout out and offer a taxi ride but they are hoping to spend some time with you regarding what they are offering. OR if you cross the highway from the Airport in Puerto Vallarta on the footbridge with your luggage, you can take a City Yellow Taxi (Airport taxis are priced higher, but somewhat more convenient). 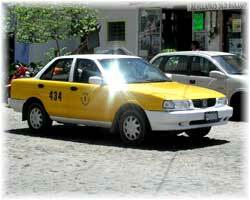 City Yellow taxi will cost about $250 pesos from the airport to Bucerias. You can also get a Taxi for $250 per hour (1/2 or full day discounts available). TIP: Get a price BEFORE you enter into the taxi. Drivers often get a kickback for recommendations, so you might not get the best advice for restaurants and bars. See our Restaurant guide here.